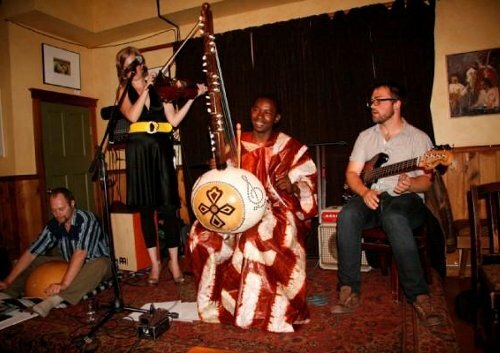 Karamo Susso is an international kora star. Growing up in a griot compound in Mali, he started playing kora as a tiny child, and was performing for large crowds before he was even big enough to hold the instrument up by himself. Fully immersed in the tradition, he learned from world-renowned players like his uncle Ballake Sissoko and his neighbor Toumani Diabate, and studied and taught kora at the Institute Nationale des Artes in Bamako, Mali. Karamo then began touring throughout West Africa, playing with such greats as Salif Keita, Toumani Diabate, Youssou Ndour, Vieux Farka Toure (son of Ali Farka Toure), and Sambou Susso, the Queen of Afro-Manding. He performed for national stadiums in Benin, Togo, Burkina Faso, Mali, and Senegal as a featured soloist with UNESCO's Fescuao Mali, and for the President's personal events in The Gambia. He made frequent appearances on national TV and radio. In Gambia, he was Composition Director for Askan Culture (the national cultural ensemble), and advisor and lead kora player for the Female Artists' Association. A natural engineer, he rapidly boosted Gambian music with his production work at The Gambia YMCA, and went on to open his own studio, Kapamis Production. Since his arrival in America, Karamo has played at university lecture halls and clubs with everyone from fellow world music stars to jazz and hip-hop groups. Audiences have been mesmerized and moved by his evocative music: dazzled by the precision of his hands as they flash up the strings, quickened by the passion and culture he articulates in gusts and expansions, and fascinated with the tangible history of his instrument. The kora, the 21-stringed harp lute of West Africa, originated in the ancient Kingdom of Mali more than one thousand years ago. Tradition tells that djinns brought it into this world and gave it to the griots: families whose place in the culture was to sing the epics of heroes and relate histories. The griots played kora and sang in court to praise the kings, and in the villages to carry news and to celebrate traditional ceremonies. The music is intricate, elegant, and potent. It is sweet while strong; percussive while lyrical, active while calm. Centuries of complex tradition are heard in it, as are simple truths.